This simple, cozy Durango vacation home is close to everything, making it an excellent travel choice for a family getaway to the mountains! This home sits on the edge of Dalton Ranch Golf Club, and is about 10 miles away from Durango proper and 15 miles from Purgatory Mountain Resort. This single-level home with an open floor plan and a well-appointed, minimalist interior is brightened by the natural light and views of the parkway through the well-placed windows around the living room and eat-in kitchen. Two sitting areas offer comfort and relaxation. One includes a fireplace and a large sofa, plus a smart TV with cable. The other is quieter, with colorful furnishings perfect for curling up with a new eBook downloaded via WiFi. Multiple chefs can cook up a storm in the spacious kitchen with standard appliances - including a dishwasher. Dine in at the cozy dining table, before the TV on provided TV trays, or outside on the patio. Three bedrooms and two bathrooms will sleep up to six guests (four adults maximum, please) comfortably. The master suite is the perfect escape for parents, and includes a king bed, deck access, and a soaking tub in the en suite bathroom. One of the rooms is equipped with twin beds and a few toys for younger guests to play with. The third bedroom has a second king bed for a second couple to share. A provided washer/dryer makes mid-vacation laundry days easy! This home is the perfect choice for a medium-size family with young children looking to putt around the golf course, ski or mountain bike the slopes of Purgatory, or do a float trip down the Animas. Take the kids on scenic train ride with the Durango & Silverton Narrow Gauge Railroad, or to Purgatory's Adventure Camp for Kids while the adults make the epic bike ride to Silverton or simply wander downtown sans the little ones. 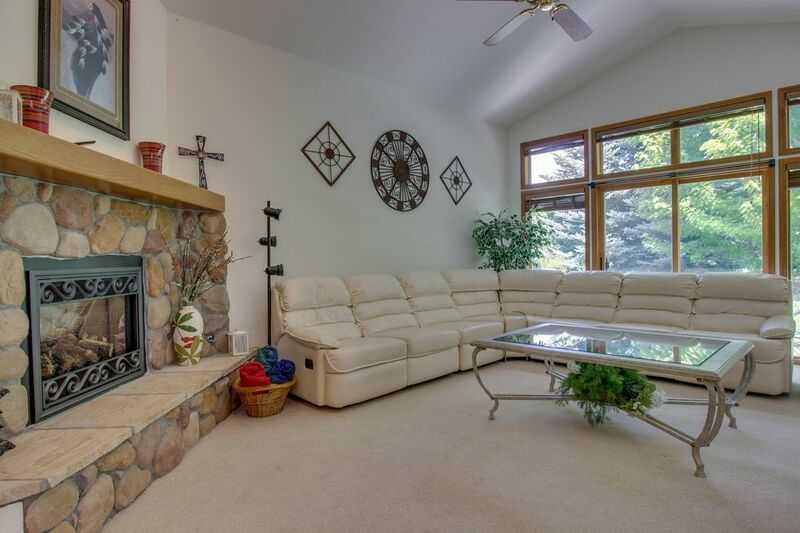 This immaculate Durango home is a real treat for families getting away from it all. Book today! Thanks for considering a Vacasa home! We provide full-service management for privately owned vacation homes, and like to think that we offer our guests the best of both worlds: the unique experience of staying in a one-of-a-kind vacation home, with the peace of mind that comes from knowing that the home you book for your special vacation is cared for by professional housekeepers and property managers. <br> <br> Vacasa began in 2009, simply because our founder and CEO Eric wanted to find a better way to share his wife’s family’s summer home in Long Beach, Washington with guests as a vacation rental. Eric and his early team worked to build Vacasa on the premise that local employees can do what they love most (taking care of guests, homeowners, and properties), while the hands-off tasks of vacation rental management��things like marketing, filing taxes, and maintaining a website—could be handled by a specialized central support team. <br> <br> Our passion is connecting travelers with the unique experience of staying in a vacation home, and we would be honored to be your host. Please contact us with any questions about this home—our team is standing by! Plenty of room for our family of 4 plus 2 inlaws. Great uncongested area, hot spring across street, PJs gourmet market, country club with yummy restaurant and golf course community very relaxing. Comfortable beds and furniture fully furnished for great vacation. Very comfortable house, comfortable beds. Garage included. We had 6 people from 4 generations visiting family in Durango; 85 yr old GreatGrandmother to 7 week old greatgrandson. The 3 bedrooms were perfect and comfortable for privacy and rest . State of the art washer and dryer very convenient. I missed actual glassware instead of just plastic goblets and plastic team giant cups. Also kitchen appliances somewhat dated but adequate for cooking meals. Great tvs, cable and Wi-Fi. Would definitely return but buy some paper to go coffee cups. Also minimal supply of bath towels provided I had to continually wash them. Very convenient to Durango surrounding area and Mesa Verde National Park. Nice place, I would definitely stay there agin. Big, well decorated and very comfortable. Love the Dalton Ranch area and have stayed there in other homes before. The location is great and we were able to check in early. However, the property lacked supplies necessary for our party of 6. We were left one trash bag and one dishwasher tablet causing us to have to go buy our own at the store. Seems like this should be a normal stocked supply in order for us to maintain the property. The kitchen was also low on the most used utensils and dishes with one mixing bowl and one spatula as an example. The guest bedroom also had no dresser or closet so we loved out of our suitcase for the week which wasn’t ideal. The back patio is beautiful and outfitted to seat all 6 of us nicely. Love the area but there are better rentals available for a group of six.